The British press are renowned for hyping up a band beyond reason and then tossing them aside when they 'fail' to meet expectations. It's a sad phenomena that has happened over and over and over again during my lifetime. One of the bands that has managed to escape that Next Big Thing label is Bell X1. The Irish band has persevered and have returned with a new album, Chop Chop (produced by long-time The National nob-tweaker Peter Katis). There's an undeniably National-esque quality to many of the songs. Tracks like "The End Is Neigh", "Feint Praise", and "Starlings Over Brighton Pier" have that slow start that builds into a barely contained frenzy without you noticing until your immersed in the middle of it. Lead singer Paul Noonan even sounds like the baritone Matt Berninger on the moody album standout "Motorcades". A piano leads the pretty lament "A Thousand Little Downers" before it erupts to fill the gaps. It's understated, yet forceful, just like "I Will Follow You". We're treated to a laid back tumbling drum on "Drive-By Summer". The melody on "Careful What You Wish For" approaches magical. Really the only tune that misses the mark is "Diorama". Despite having a great title, the song sounds too much like early Coldplay (ie dull) in comparison with the rest of the material in the collection. It's refreshing to hear a band that's gone through the music press ringer and come out the other end as mature, sophisticated artists. 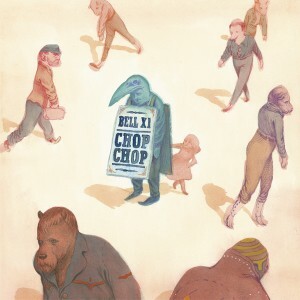 Chop Chop is proof that Bell X1 have done exactly that. Best tracks: "A Thousand Little Downers", "Motorcades"